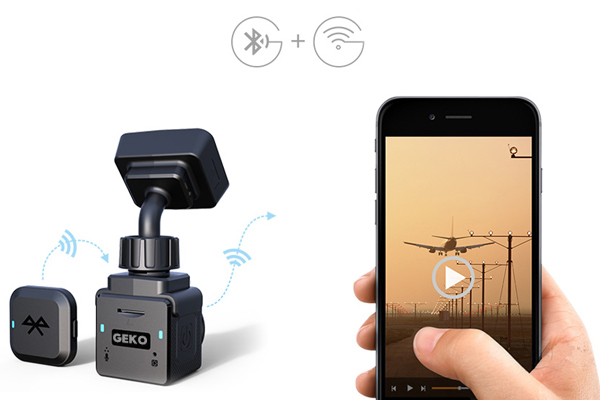 Los Angeles, CA (December 20, 2016)- GEKO reveals the Xpedition, a smart dashcam capable of WIFI and Bluetooth connection, and GPS tracking. This loaded dash cam will be on interactive display in Las Vegas at the upcoming 2017 CES Show. Wi-Fi, Bluetooth, and GPS have all come together to build this multifaceted dash cam, the Xpedition. This dash cam comes with a small Bluetooth enabled remote and when pressed, the camera captures both a 2 megapixel image, and, records a short video. Once the Xpedition App is installed on your smart device, you can connect to the camera via WI-FI, allowing you to download, edit, add music, and share videos and pictures as well as view your video as it streams live straight from the app on your device. As if not enough, the built in GPS displays your speed and location on a Google map alongside your video, so you’ll know exactly where the footage was taken and the traveling speed. Finally, thanks to the app, firmware updates can be done simply from your phone. This tiny 32mmx32mm cube is equipped with everything needed to document life’s journeys. The MSRP for the Xpedition is $169.99 USD, and $199.99 CAD. As of now, it is available only in Canada, but will be available in the US February 2017. For more information, please visit the Geko booth at CES 2017, South Hall #35242, or visit the website at http://bit.ly/prxpedition.